Plácido Domingo Hijo, Luz del Alba Rubio, Walter Blanco, Fernando Bigliante, Gardeleando. 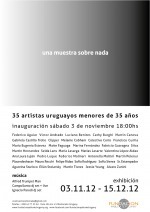 collective exhibition of 35 uruguayan artists under 35 years old. 6.30pm - Linda Kohen "Living" and Gustavo Vazquez "Southern Light"